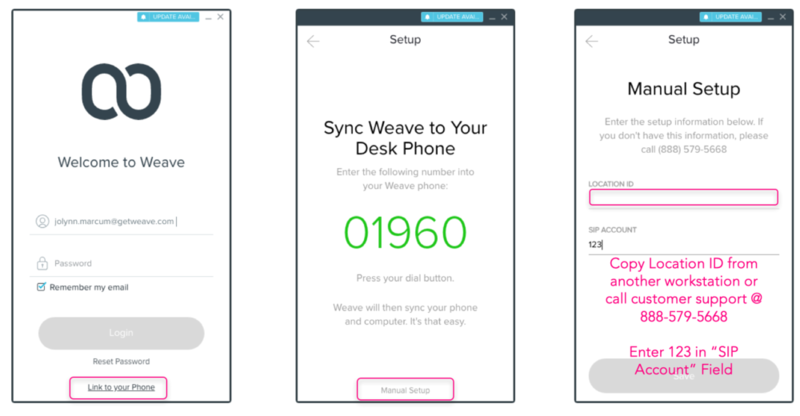 To sync your Weave software with your phone system you will need to dial the 5 digit number you are prompted to dial into your Weave Phone. If your Weave software was installed before your phone system, or if you have had an interruption in your internet or power, you may need to re-sync your software to your phone at your workstation. This is simple to do. Simply select “Link to Phone” on your log in screen. This will generate a 5 digit code for you to dial on your phone. Once you have dialed the number on your Weave phone your phones and practice management software should be synced up. Weave can be install on any work station in your practice, even if there is not a phone at that workstation. You will need to follow the following Manual Setup instructions. Enter your location ID provided to you by Weave’s Customer Support (888-579-5668) or your Onboarding Representative. You can also find your location ID by following these steps and copying your location ID from one of your other work stations that is synced with a phone. Enter “123” in the “SIP ACCOUNT” field and press “SAVE”.